Because of Ravelry I am finding all these great patterns that I wouldn't have noticed before. Tea Leaves is just lovely, I've worn it two days in a row! 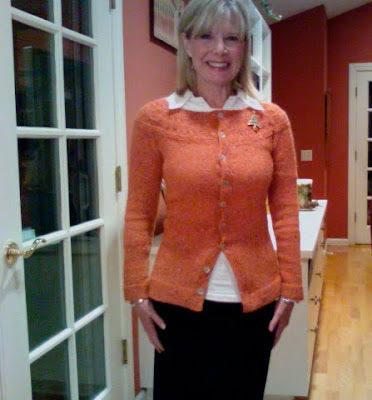 Because I didn't like the look of this cardigan with positive ease I made a few simple changes. The pattern calls for 20 stitches per 4" and my gauge was 24 using Rowan Felted Tweed. This gauge change and also casting on a few stitches less than the pattern called for brought this sweater in from a size 34" to around 31". I added waist shaping. I will try to decipher my notes and have more disclosure on my Ravelry post. Tea Leaves is knit from the top down, with little more than stockinette and garter stitch. 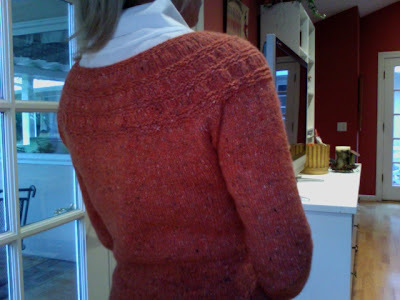 The yoke detail is created with knit front/back of each stitch, then k2tog a few rows later. There is also a pattern for a Tiny Tea Leaves which I am making for my 10 year old granddaughter in a purple merino/silk DK that washes well. 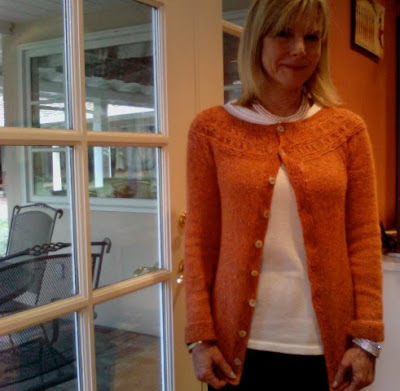 Tea Leaves Cardigan by Melissa LaBarre. 5 skeins of Rowan Felted Tweed in Tangerine. Take care till next time. Beautiful - and what a great color of Felted Tweed! The white makes it work with your coloring just fine. and yep, isn't Rav amazing?? 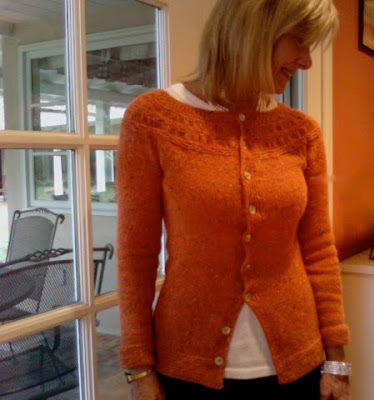 That's really pretty- I like your fitted version better than the looser ones that I've seen on Ravelry. so lovely!! that colour is amazing. I was thinking the very moment I saw this that the color was just great!! I really do like the modifications you have done. I have already knit Tea Leaves and really liked it, but now I think I will do another using your slimmer fit. Great job! You make my day when you make a comment! Hello, I am Kristen, the writer, photographer, knitter and gardener of the Knitionary blog. Thank you so much for stopping by to visit. To learn more about me click here.